"That was amazing! Where did it.....oh." This past series against the Blue Jays was neat. They took two of three from the Blue Jays and in the process, beat one of their better pitchers who used to be one of our kind of okay but could be really good pitchers. This wasn't a must win series and the team didn't even get to play spoiler. On the plus side though, Seattle did get to hit against Brandon Morrow and actually, like, hit. We'll get to the series recap in a second. One thing I want to mention first, then we can get to it. In a game recap on Lookout Landing, Jeff Sullivan mentioned that with his two RBI in the first game of the series, Kyle Seager "...pushed his season total to 81, making him the first Mariner to reach 80 RBI since 2009. He was already also the first Mariner to reach 75 RBI since 2009, and 70 RBI, and 65 RBI." Out of morbid curiosity, I decided to find out who the team leaders were for 2010 and 2011. In 2010, the team leader in RBI was Franklin Gutierrez with 64. This was a team that scored a total of 513 runs. That's an average of 3.2 runs a game, which just makes me sad, so we'll move on. In 2011, Miguel Olivo led the team with 62 runs batted in, while the team scored 556. An average of 3.4 runs a game, which is .2 runs better than it was in 2010! Improvement! Then again, through 144 games this season, they're average was 3.2. On that wonderful piece of knowledge, the recap! 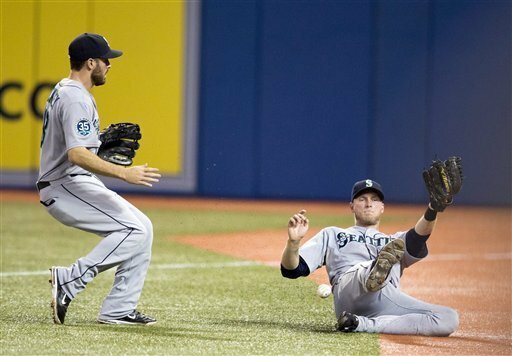 On Tuesday, Seattle was in Toronto to play the Blue Jays. It'd be kind of weird if they were in Toronto to play the Maple Leafs, since that's a hockey team. In case you didn't know, now you do. Use this information for the greater good. As stated above, Brandon Morrow was the starting pitcher for the Blue Jays. In the other dugout, pitching for Seattle when the Mariners were on the field, was the wonderful Erasmo Ramirez. It marked the first start for Ramirez in the majors since June 30th and his second appearance. Erasmo lasted a solid 7 innings, allowing only two earned runs on six hits, a walk and six strikeouts. Since the beginning of the season, and pretty much since he entered the system, we'd heard he was a strike thrower and didn't like to miss the strike zone because if he did, something bad would happen. Given our catching situation on the defensive side, can you blame him? Yes, there is a point to that, just stick with it. For the game, Ramirez threw 90 pitches with 66 going for strikes. That's 73% strikes out of 90 pitches. I only mention this because, through three innings, he had thrown 34 pitches and had exactly 4 balls called against him. Read that one more time. 34 pitches, 30 strikes. 88% strikes, which is just..... Earlier in the season, Bartolo Colon threw 38 consecutive strikes. That's not normal. Actually, it's pretty far from normal. What Ramirez did through the first part of the game is just this side of that Bartolo Colon line of abnormality. Erasmo Ramirez is 22 years old, and this is his ceiling as a starting pitcher, most likely. I think we'll take it. Oh hey look, there was offense too! Seattle got off to a decent start, getting two runs on RBI singles from Kyle Seager and Michael Saunders. The Blue Jays got a run back in the bottom of the first, but Seattle struck again in the top of the third thanks to an RBI single from John Jaso. A sacrifice fly by Colby Rasmus closed the gap to one run in the bottom half of the inning. Then Seager came up in the top of the fifth and launched a solo home run to deep right field to make the score 4-2 Seattle. Thanks to 4 different pitchers in the bottom of the eighth, the Blue Jays pushed a run across to make it a one run game. There would be no more scoring, thanks to Seattle's inept offense and the work of Tom Wilhelmsen in the bottom of the 9th to close it out for a final score of 4-3. Game number two in the series was amazing, in that Seattle won. Also amazing, as we found out later, was that Kevin Millwood plowed through 5 innings of solid work to give the Mariners a fighting chance and his arm didn't disintegrate after leaving the mound. It wasn't until after the game it was discovered that Millwood was pitching with a sore shoulder. Come to think of it, that's kind of mean. Hey Millwood, give the young guys a chance. Who do you think you are? He says, dripping with sarcasm. Not dripping with sarcasm is what the big right hander had to say about his outing, "I felt like...I could still throw the ball where I wanted to, there was just really nothing on it.'' Given the offense he was facing, he did a great job keeping the Blue Jays to only two hits and one earned run in those 5 innings of work. He allowed only one walk and three strikeouts. His only blemish came in the bottom of the fourth when he allowed a two run bomb to Edwin Encarnacion. Seeing as how before that moment, Encarnacion had himself 38 other home runs, I'd say Millwood's mistake was forgivable. On the offensive side of the ball, the Mariners got their offense from Miguel Olivo on a solo shot in the top of the second. Franklin Guiterrez put Seattle up by a score of 3-0 in the top half of the fourth with a two run single. The Blue Jays countered with the aforementioned two run homer by Encarnacion to get them within one. That was all the scoring they'd get though, as the bullpen went to work the last four innings and allowed no hits the rest of the way. The last game of the series featured The King himself, Felix Hernandez. Unfortunately for the M's, that's where the good news ended. Felix battled through the first four innings of this one, limiting the damage to two runs from a two run home run off the bat of Adam Lind. Seattle came back to tie it in the top of the second and there the score remained until the bottom of the fourth when the Blue Jays put up a 5 spot, making it 7-2 in favor of the Jays. Felix was getting hit and for the first time in a while, he was getting hit hard. He was having trouble consistently hitting his spots, but even when he did throw it where he wanted it, the guys in the other jerseys would get wood on it. He finished his night allowing seven earned runs on ten hits, a walk and four strikeouts while laboring through four innings of work. One bright spot in the game was the 22 year old rookie Carlos Triunfel collecting his first big league hit, a double off of Blue Jays pitcher Aaron Loup in the top of the ninth. Dustin Ackley checked in with a solo shot to center field in the top of the seventh, his eleventh of the season. By then it didn't really make much of an impact, unless you consider maybe adding a rung to the bottom of the ladder of the very deep hole the M's were in as an "impact". Our Seattle Mariners headed to Texas to get a three game series going against the Rangers. Seattle already lost the first game by a score of 9-3, and now you have the recap for that particular game as well! In the final two and a half weeks of the season, Seattle has three games against the Orioles, three against the A's, five against the Rangers and six against the Angels. Hold on to your hats everybody, this may be a bumpy ride.